One of the world's great train trips - an experience not be missed. Taieri Gorge Railway offers a scenic train trip into the spectacular Central Otago Hinterland and up the ruggest Otago Coast north of Dunedin. 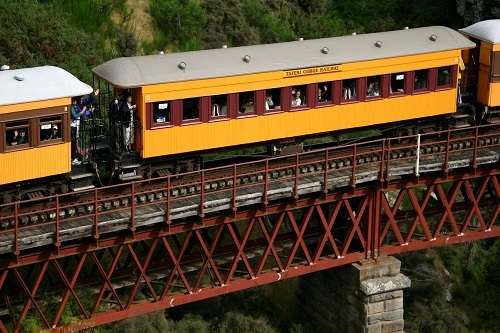 The Taieri Gorge Railway offers unique and panoramic views over ever-changing scenery. There are opportunities for photos where the train either slows down or stops for you to disembark. There is a licenced Café and bar on board and live commentary on all trips. Once a week in Summer (Some exceptions due to Cruise Ship visits, October to April) and once a week in Winter (May to September) the train extends its journey to the very end of the railway line to Middlemarch, a lovely example of a country railway town and the beginning of the Otago Central Rail Trail.